Gun versus. bow: which one is right for you? That’s the question, isn’t it? 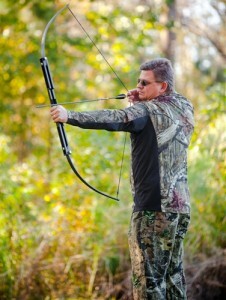 Looking at bows – your needs will often dictate the size and shape of your survival weapons. 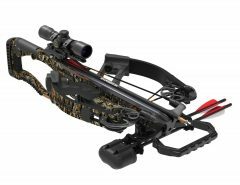 These kinds of weapons can be designed from nearly everything: high-end take down bow with more than 80-pounds of draw to a twig and paracord. 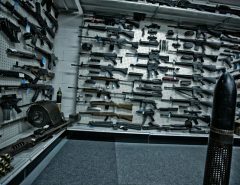 Looking at guns – the most powerful survival weapons ever developed are firearms. In fact, today’s rifles have been designed to hit targets more than 600 yards away with supreme accuracy. The ammo can bring the target down, allowing them to either slowly bleed out or die immediately. So, which weapon would be ideal – gun or bow? 3 What Weapon Would Be Better? Bow survival weapons are a great choice – run out of gun ammo and you’re out of luck. 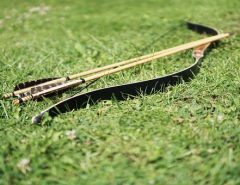 However, with a bow, you can shoot at animals or other things and even if you hit a target and it gets away, you just need another arrow – made of another kind of material – to go back to hunting. And, that’s the best thing about arrows – they can be made from most kinds of materials. You do need to be able to choose the best survival bow. 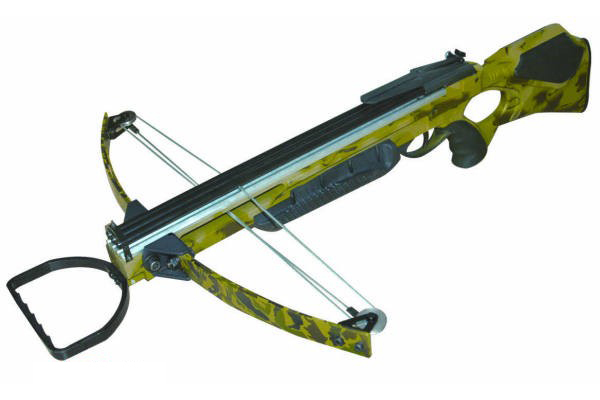 Also check out our reverse croosbow page and also our recurve vs compound bow page. 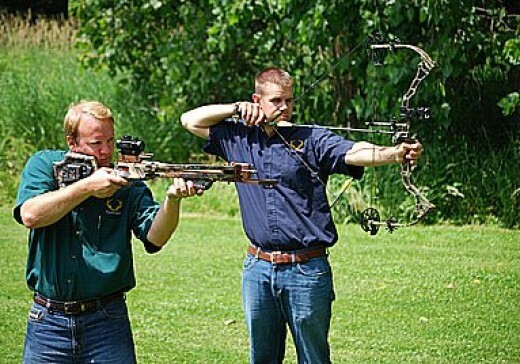 Another worthwhile trait of bows is that they’re silent, especially if they’re used correctly with string silencers. Bear in mind that not all occasions are going to involve animals. If you’ve got a smart enemy, he can keep tabs on you based on the direction in which the arrow came from if they see it flying at them. The speed of the arrow, compared to bullets, is extremely slow – no sound can be heard when done correctly. This means you can shoot the arrow and be gone before the enemy has a chance to be alerted to the direction you were in. One of the biggest downfalls of the bow is the rate of fire; an issue that goes back to the middle ages. 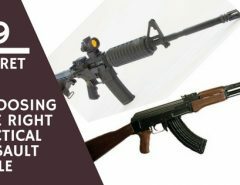 With modern-day firearms, the rates of fire increase with new technology making sure that misfires happen less and less. 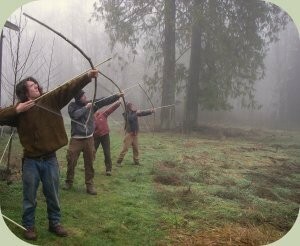 It’s difficult to get training to properly use the bow to hit the target. There are some rapid-fire archers that can shoot three targets while running. The problem is that it took them years to learn how to do this – training to learn how to aim and hit the target. If you’ve just begun using the bow, this could be a big issue. Practice will make perfect. In order to hit a target with a bow shot, you need to be closer than you would if you have a rifle. This means you need a higher degree of stealth efforts and situational awareness without letting the target know you’re around. 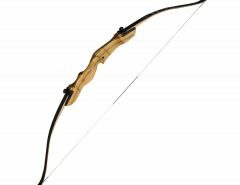 Most survival bows need you to be within 50 yards of the targets. Guns have the stopping ability and power to take down someone or something with very little effort. Bow survival weapons cannot compare to this kind of power seen with firearms. Firearms are not that difficult to learn and can stop something immediately. This can be seen in the various news reports all around the world – children using guns to hold off intruders in their home. And, be honest, the loud sound a gun makes can make any person second guess themselves on the attempt they’re trying to make. A real issue in today’s world is the shortage of ammunition. And, if there is a shortage, it’s not going to get any better if there is a situation where survival is the key. In many city environments, even if you can find someone with reload kits to barter with to get new ones, you’ll still have to pay to get it – supply and demand. Every bullet counts, which means you can’t target practice like you can with bow and arrow. When it comes to bullets, they’re not all the same. In fact, if you find ammo on the ground or in the woods that fits your gun, it may actually not be the right kind of load for it. How much powder is in the casing? Sure, your rifle may have killed a bear several years ago, but that doesn’t mean some random bullets you find are going to do the same thing. Powder loads play a huge part in bullet effectiveness. It’s imperative that your gun is kept clean – a golden rule that’s been drilled into every person who’s taken firearms training. Sure, you may have a cleaning kit but do you have it when it’s necessary? What do you do when you’ve got no gun oil and no suitable alternative nearby? All the ammo on Earth isn’t going to make a bit of difference if you’re unable to properly clean your firearms. Plus, if you try shooting it for a long time, it’s bound to get jammed or blow the gun apart (and yes, that does happen!). Of course, if you’re in a situation where you need to stay in your vehicle for a couple of days until the search party finds you, it’s a bit different. However, in most instances, you’re going to be in the “flight or fight” mode of survival. One of the biggest negative aspects of a gun is the sound it makes – something you don’t experience with a bow and arrow. If an arrow missing its target, the deer may look up for a moment, which lets you get that second chance to take it down. However, bring in a gun and do the same thing, and the deer is going to take off like a bolt of lightning. And, the sound is also going to let other people know you’re around. If you’re in survival mode, not all the other survivors are going to help you or want to barter. They’re going to want what you have – guns, foods, ammo, medicine, etc. If you’re busy going after your food, you may not even realize they’re nearby you. What Weapon Would Be Better? Would a bow be something you’d choose over a gun? Sure, the gun can be readily used unlike a bow. But, if you missed your target and ran out of bullets, you’d be scrambling to find a way to make more or find the ones that didn’t hit anything. This just isn’t always feasibly possible. And, with a bow, you can easily sneak up on your target. On top of that, bowhunters are usually the ones doing the tracking, trying to locate the final resting place of their target before they can go after the meat. 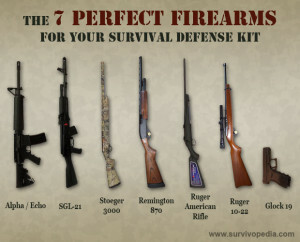 So, again, the question is presented to you: what is your preferred survival weapon: a firearm or bow and arrow? Also check our Best Machete Guide!